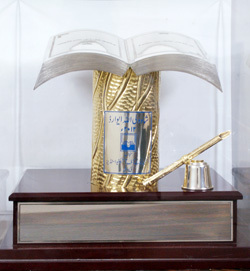 To commemorate the outstanding services of Hazrat Shah Waliullah and to promote the Islamic values, the Institute of Objective Studies instituted an Award known as "Shah Waliullah Award" to honour eminent scholars who have done outstanding work in Social Sciences, Humanities, Law and Islamic Studies. The Award is in the form of a cash of one Lakh rupees, Memento, shawl and a scroll of honour containing citation which is given annually to the best scholar of the year. The scheme was started in 1999. The scheme is administered by an independent Board which nominates a Panel of Experts consisting of eminent scholars to identify and recommend the scholar to be honoured. The subject or the field of the Award is decided by the Board for each year. The first Shah Waliullah Award (1999) was conferred posthumously on Maulana Syed Abul Hasan Ali Hassani Nadvi (R.A), popularly known as Maulana Ali Mian, on 3rd of November, 2000. The second Shah Waliullah Award was conferred on Janab Qazi Mujahidul Islam (R.A), the renowned Islamic scholar and an authority on Islamic Fiqh. The third Shah Waliullah Award was conferred on Prof. M. Nejatullah Siddiqui, an authority in the area of Islamic Economics and Islamic or Interest-free banking. The fourth Shah Waliullah Award was presented posthumously to Hazrat Maulana Mohammed Shihabuddin Nadvi (R.A.) on 27th March, 2004, who made an outstanding contribution in the field of Qur'anic Uloom. The fifth Shah Waliullah Award was conferred on Prof. Mohd Yasin Mazhar Siddiqi, the renowned scholar on Historiography in Islamic Perspective on 24th September, 2005. The sixth Shah Waliullah Award could not be conferred because there was no unanimity on the candidate, nor an appropriate standard of excellence in the candidate available. The seventh Shah Waliullah Award was conferred on Prof. Tahir Mahmood, the renowned scholar on Islamic Law on 11th July, 2009. The eighth Shah Waliullah Award was conferred on Dr Maulana Taqiuddin Nadvi, the renowned scholar on Hadith literature on February 26, 2011. The ninth Shah Waliullah Award was conferred on Dr. Mohammad Khalil Abbas Siddiqui, the renowned scholar on Social Anthropology in Islamic Perspective on December 15, 2012. The tenth Shah Waliullah Award was conferred on Maulana Syed Mustafa Refai Nadvi Jilani on August 23, 2014. The eleventh Shah Waliullah Award was conferred of Maulana Syed Rabe Hasani Nadvi, Reactor, Nadwatul Ulema, Lucknow on August 01, 2015 and the twelfth Shah Waliullah Award was conferred of Mr. Syed Iftekhar Gilani on April 03, 2017. The topic for the next Shah Waliullah Award is "Islam and Political Science". Further, under essay writing competition (for junior category) the Institute invites yearly the young scholars and researchers to submit the essay on the topic/subject (to be decided each year). The essay on the topic "Shah Waliullah's Approach to the Qur'an" for the year 2002 written by Janab Mahboob Farogh Ahmad Qasmi of Darul Uloom Deoband was considered as the best for the award, while the topic of the essay for the second award was "Human Rights in Islamic Perspective" and the essays written by Ms. Najmus Sahar Tahsin S. of Chikmaglur (Karnataka) and Mufti Md. Serajuddin Qasmi of Islamic Fiqh Academy, New Delhi were considered as the best for the award jointly, while the topic of essay for the third award was "Intra-Community Dissension and the unity of the Muslim Ummah" and the essay written by Mr. Anis Ahmed Falahi, Jamiat-ul-Falah was considered as the best for the award. The topic for the fourth award was "Constitutionalism in Islamic Perspective" and the essay written by Prof. Faizan Mustafa and Dr. Afroz Alam was considered as the best for the award and the topic for the fifth award was "Education in Islamic Perspective" and the essay written by Ms. Najussehar and Mr. Kefayetullah was considered as the best for the award and the topic for the sixth award was "Media, Society and Indian Muslims" and the essay written by Dr. Nasheed Imtiaz was considered as the best for the award. The topic for the next essay writing competition is "Political System in Islam: Relevance to Modern Time". 1. The Award will be administered by an autonomous Board appointed by the Governing Council of the Institute of Objective Studies. 2. The Board shall nominate a Panel of Experts to identify and recommend the recipient of the Award. The Panel shall consist of at least three eminent scholars from disciplines or fields in which the Award is to be given. The composition of the Panel will change every year according to the discipline or field in which the Award will be given. 3. The subject or theme of the Award shall be determined by the Board in each year. 4. Only Indian citizens shall be eligible for the Award. 5. The Institute of Objective Studies shall solicit the opinion of scholars, heads of university departments and the ulama for nominating the recipient of the Award. 6. If the work of a nominated scholar happens to be in a language other than Urdu, Arabic and English the publications will be required to be submitted along with a brief summary in English for the consideration of the Panel of Experts. 7. Self-nomination shall not be entertained. 8. The bio-data of the scholars nominated for the Award should be submitted as per the prescribed format. 9. While making the nominations, the totality of the work of the nominated scholar would be kept in view. 10. The recipient of the Award will not be eligible for the award for the second time for the next 5 years. 11. Nominations should be accompanied by a brief bio-data of the nominated scholar and at least two of his/her works, which are supposed to constitute his/her most important contribution. 12. The decision of the Board regarding the selection of the awardee shall be final. 13. The Board may defer or withhold the Award in a given year, if nobody is found suitable for the Award. 14. In a situation where there is no clear nomination for the award, or where the opinions of the proposers are divided, or where the person nominated by the Board for the Shah Waliullah Award declines the award, the Shah Waliullah Award Board will have the authority to nominate an eminent scholar for the award. 15. The Award may be given posthumously, provided the death of the nominated scholar has not occurred more than five years before the last date prescribed for submission of nominations. Shah Waliullah (1703-1763) was one of the most outstanding Muslim scholars of eighteenth century India. He was a rare polymath who made highly original and seminal contributions to a variety of Islamic disciplines, including the translation and exegesis of the Qur'an, Hadith, Fiqh, historiography, Kalam, Tasawwuf and Islamic philosophy. He played a pioneering role in the revival and regeneration of the intellectual, moral and cultural legacy of Islam and thereby influenced and inspired several generations of Muslims in the Indian subcontinent. One of the most important and enduring contributions of Shah Waliullah relates to the Holy Qur'an. Four distinctive but interrelated dimensions of his approach to the Holy Qur'an and his contributions to Qur'anic studies are noteworthy. He emphasized the pivotal role of the Qur'an in the Islamic ethos and considered it incumbent on every Muslim to understand its meaning and message. Realising that a majority of Muslims in India were not sufficiently conversant with the Arabic language, he undertook a translation of the Qur'an into Persian. Subsequently, two of his sons rendered the Qur'an, on the basis of his Persian translation, into Urdu, the lingua franca of Muslims in large parts of the country. These translations paved the way for the translation of the Holy Qur'an into other vernacular languages. Shah Waliullah firmly believed that religious instruction in Islamic madaris should begin with the learning of the Qur'anic text, followed by its translation and explanation of difficult words and passages as well as a brief commentary in the local language. He believed that this should form an inseparable part of the curriculum of Islamic madaris. He realized, to his dismay, that the scholars and ulama of his times were deeply enamoured of Greek philosophy and attached undue importance to philology and grammar. He cautioned them against the insidious consequences of this preoccupation and urged them to turn instead to the fundamental sources of Islam - the Qur'an and Hadith - which alone could provide a true understanding of Islamic teachings and principles. Shah Waliullah was acutely aware of the need to interpret and project the teachings and principles of Islam in the contemporary academic and literary idiom. He worked out, for this purpose, a comprehensive and cogent system of Islamic philosophy and scholasticism based essentially on the edifice of the Qur'an and Hadith but presented in the idiom and style of his time. 13th Shah Waliullah Award on "Islam and Political Science"
The last date for receipt of nominations is 15 January, 2018. Islam, in its broader sense, is guiding force that permeates to each corner of existence in all forms and stages. It believes in the principle of unity of God, unity of existence, unity of thought that strives to give immense contentment to soul in all forms. It takes man as an embodiment of spirituo-moral excellence which may be attained through faith and positive action meant to be devoted to seek the pleasure of Almighty Allah. Allah Subhanahu Taala has created man as the crown of creation and His vicegerent on earth. This makes man special and unique in His Scheme of things. Now, a pertinent question may be raised as to how this responsibility can be discharged in its true and real form. State provides necessary authority to take compelling decisions. This seems to be a point to introduce Political Science as a discipline, in the words of David Easton 'to deal with 'authoritative allocation of values', which means taking decisions backed by sovereign authority of State. Hence, Islam becomes highly relevant to deal with the institution of State and governing system. The moment this point is established a new window leading to study theory and practice of State is in full view. Coming to political science, Robert A Dahl takes politics as a set of human interactions, which focuses on patterns of distribution of resources or values in the society. It is also an authority or power to deal with relations in it. Further, emphasis is on policy outcomes appearing in the writings of Harold Laswell, who defines politics as being concerned with 'who gets what, when and how'. This definition looks politics in many social settings including those of governing institutions. Hence, the subject matter of political science has undergone a transformation from an emphasis on State structures to set of human behaviour and interactions concerning with allocation of scarce resources, which are considered essential for dispensing with high moral grounds and standards set by Islam to bring about equality, liberty, fraternity and social justice. Additionally, the 19th century positivists and empiricists emphasized the search for a good society concentrating on finding evolving standard norms of behavior in thought and action. Individual and collective consciousness of Islam revolves around the Islamic prayer, saying to 'Guide us to the straight path'. Inherent in the prayer are the principles of good life, of social solidarity and equality, of leadership and obedience, responsibility and responsiveness and of universal brotherhood. Same spirit goes in other sectors of human life in the form of training in social living. The more one follows the training, the more is harmonization of ideals and practices of Islam. Politics is also central to Islam, if it is defined in its narrow sense, it means the art of governance. Quranic exhortations of enjoining the good and forbidding the evil of upholding justice and other divine values and criteria, require the participation of all members of society in the affairs of government towards ends laid down by Allah (SWT). Quran condemns anarchy and disorder (2:205) and the Prophet (SAAS) stressed the need for organization and authority in society. Islam upholds an organic, holistic approach to life in which religion is intimately intertwined with politics, law and society. Islam also shatters the absolutism of semi-gods and false deities, to divest them from any leadership roles; to rest power for the righteous and to reinstate good in place of evil. One of the major objectives of his hijra (migration to Madina) was to establish political authority in accordance with Divine will. Islam is thus actively concerned with power, through which the world would be transformed to be in accordance with Islamic tenents and principles to benefit humanity. Islam puts power in an active moral framework. It is not an end, but a means to serve Allah (SWT) to earn a blissful eternal life and thus a source of mercy and justice for humanity. The foregoing explanation points to the fact that a fusion of religion and politics is dictate of Islam and cannot be disregarded in any form. In Islam, ethics sets the tone of politics and rules of political behaviour. Thus, the major concerns of politics are striving to control the State structure, to wrest power for the righteous, to root out evil and bring about a good life. In terms of historical evolution of political science, thinkers and political philosophers have contributed immensely. Three major trends in intellectual history may be identified: (a) the Mystics (Sufis), (b) Thinkers and Jurists, and (c) Ulema. These categories have contributed to the growth of political science within the framework of Islam. However, there is a notable despondence during last two centuries. Nevertheless, the torch of inquiry into political aspects has been kept in high by few quarters. It is encouraging that some quarters are taking up challenges in these areas and a viable picture may emerge on the horizon. Islam is a well ordered system of life that deals with all aspects of human existence and performance. It is a consistent whole, comprising of universal principles and cultural values for complete guidance of humanity. Political Science provides thought and action plan based on Islamic philosophy and values. Hence, there is dire need to understand and pursue real relationship of Islam and Politics. This would enable the unity to find appropriate ways and strategies to exist and develop. Essay Writing Competition (Junior Category) on	"Political System in Islam: Relevance to Modern Time"
The Institute of Objective Studies invites essays on the topic of "Political System in Islam: Relevance to Modern Time" by young scholars and researchers. The best essay will receive a cash award of Rs. 25,000/-. The last date for submission of the essay is 15 February, 2018.
i)	The candidate should be below 45 years of age. ii)	The essay should have a high academic standard and should not exceed 10,000 words. Detailed references should be appended at the end of the essay. iii)	The essay should be submitted in quadruplet, along with the curriculum vitae of the candidate. iv)	An essay which is submitted for the competition should not have received any award by any other organisation or institution. If the essay wins the award, the IOS will have the exclusive right over its publication. v)	The decision of the IOS on the selection of the best essay shall be final. Islam, surrender to the will of Allah which brings about peace within and without, is a complete way of life. And life is both soul and body, spiritual and material. Islam, therefore, is complete code of life covering both its spiritual and material aspects. The Prophet (PBUH) established and headed the city state of Madeenah which was religiously plural. Although he was the Prophet, fully under divine guidance and protection, Muhammad, peace be upon him, always followed the Quranic injunction: wa amrohum shura bainahum, (they) conduct their affairs through mutual consultation. So we see the Prophet consulting his companions on all important issues, social, political and military which arose in his time. The practice of mutual consultation continued during the time of the rightly- guided Caliphate also. The democratic principle of political life in Islam, especially regarding the succession of rulers was subverted by Ameer Muawiya when he appointed his son, Yazeed as his successor. It was a bad innovation but sadly has become such a strong institutionalized tradition that it continues even today in many parts of the Muslim world. Muslim scholars from medieval period to modern time, have been preoccupied with what may be described as the development of political theory of Islam. The early biographers of the Prophet gave equal importance to his political and military activities and decisions that he took for dealing with such issues. Later, when the Khilafah was converted into Mulukiyat, monarchy they either opposed it or explained the political system of Islam in ways they thought was appropriate in the then prevailing conditions. Mawardi, Ibn Taimiya, Ibn Khaldun and others even sought to develop a political theory of Islam. In view of the strong emphasis on democratization of social life in Islam, democracy and its various institutions should have first developed in the world of Islam. Unfortunately the Khilafah of democratic nature and content was replaced by monarchy which has historically been the hallmark of political system and establishment in the Muslim world. It saddens that when in the modern time democracy emerged as the most prominent feature of modern civilization, Muslim scholars had to explain that Islam was neither opposed to nor incompatible with the concept of democratic governance and system. Khilafah and Shariah emerge as key politico- legal terms when we try to explain or develop a political theory and system of Islam. Khilafah, broadly speaking, is the political system and order of Islam and Shariah is its legal system. The Quran has urged Muslims to conduct their social and political affairs through mutual consultation. The term, Khilafah has not been used in the Quran to describe the political system of Islam. But man has been described as Allah's Khalifah, vicegerent on earth. Abu Bakr, the first Caliph chose to be called Khalifah, the Prophet's successor in worldly matters. His immediate successor, Umar, preferred to be called Ameer al Momineen. However, the subsequent pious Caliphs were called Khalifah which thereafter became a common practice in the Muslim history. But it ought to be noted here that although a great majority of the Muslim rulers preferred to be called Khalifah like the rightly- guided Caliphs, they behaved as absolute rulers. Similarly, Shariah has normally been the law of Muslim states and empires till the onset of the modern age when a large portion of the Muslim world was colonized by the European powers. Shariah is the body of laws drawn from the Quran and Sunnah as well as developed by the Muslim jurists in their light. Shariah, therefore, is partly divine and partly human. The Board administering the Shah Waliullah Award has decided that the prestigious prize for the thirteen Shah Waliullah Award will be conferred on a person/ scholar who has made outstanding contribution in the field of Political Science from an Islamic perspective. As per our tradition the Board also invites young scholars to participate in the essay competition through well written scholarly articles on "Political System in Islam: Relevance to Modern Time".